There are as many ways to stuff a pepper as there are stars in the sky. This version uses ground turkey and a blend of brown and wild rices, topped with a smattering of nuts for a little extra crunch and flavor. I parboil my peppers before stuffing and baking to ensure they’re tender and easier to enjoy. Brown ground turkey in a large saute pan over medium-high heat. Add onion, garlic, diced pepper and celery and cook, stirring frequently, about 10 minutes. Reduce heat to medium, add water, rice and seasonings and stir. Simmer uncovered about 60 minutes, until liquid is absorbed and rice is tender. Remove from heat. Bring a large stock pot of water to the boil and add the green peppers. Cook 4-5 minutes. 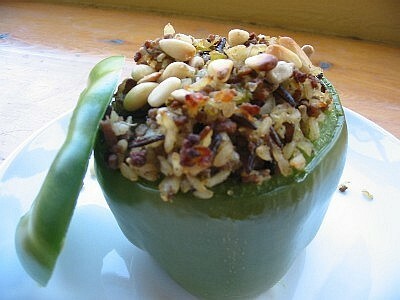 Remove peppers, place in baking dish and fill with turkey-rice mixture. Sprinkle nuts over top of peppers. Place on middle rack in oven and bake 30 minutes. Remove from oven and serve immediately.